If educators could create the ideal classroom, they'd give themselves more room, and it would be more open and flexible and include collaborative spaces. According to a recent survey, those bigger spaces enable group work, discussions and independent learning, while smaller rooms are more likely to lead to distractions that deter learning. As one teacher reported, "We teach classes of as many as 36 students. In some classrooms, students are practically on top of each other. There is no space to have quiet conversations, to work on writing, to do book groups. Space is premium." The way the room is designed and set up affects student success; 94 percent of teachers said they believe that having a "positive environment" improved learning either highly (60 percent) or moderately (34 percent). Those results came out of a research project undertaken by MDR, an education-focused marketing services agency, and a trade organization, the Education Market Association. Between May and June, a total of 1,685 teachers and librarian/media specialists filled out an online survey, intended to help researchers understand how the design of learning spaces affected student outcomes. A goodly number of educators like to reconfigure their classrooms frequently; 30 percent said they change up their rooms between once a week and "multiple times a day." The top pedagogical goal for any redesign effort: to accommodate the use of new technology, cited by 56 percent of survey participants. However, after remodeling projects were done, under a third of teachers (30 percent) found that their pedagogical goals aligned with their new physical space; the majority (52 percent) said it simply made the room more "attractive or functional." Incorporating outside views and natural light (78 percent). Technology improvements outshone many other desired projects, including changes to the orientation of the room (71 percent vs. 30 percent), adding or remodeling maker spaces (71 percent vs. 31 percent) or adding open concept spaces (71 percent vs. 37 percent). 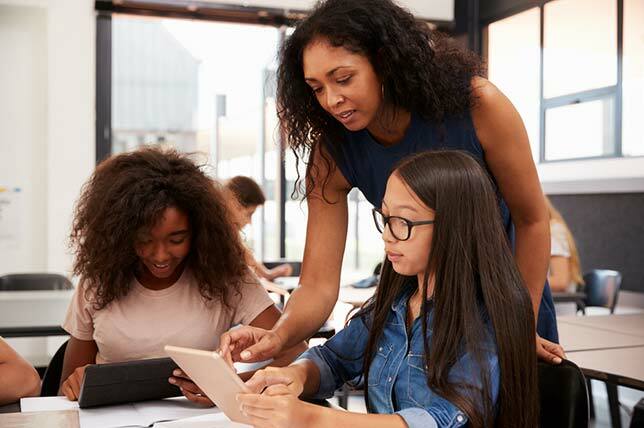 Nearly three-quarters of educators (72 percent) believed their classroom environment was either "very" or "somewhat" conducive to 21st-century learning. However, teachers working in schools with high poverty-levels (surpassing 30 percent) were also less likely to consider their current environments "conducive" (68 percent) compared to people in schools reporting the lowest poverty level (80 percent). "Teachers across the country overwhelmingly agree that creative learning spaces play an important role in student engagement," said Melissa Pelletier, MDR education research editor and an author of the study, in a statement. She added that the report is intended to help companies that work with schools "gain valuable insights into what teachers believe creates learning environments that encourage all students to collaborate, develop critical thinking skills, and achieve their highest potential." The report is priced at $1,499. More information is available on the MDR website.